Cambridge International AS & A Level Further Mathematics supports students following the 9231 syllabus. This single coursebook comprehensively covers all four modules of the syllabus and helps support students in their studies and develops their mathematical skills. 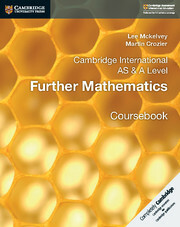 Authored by experienced teachers of Further Mathematics, the coursebook provides detailed explanations and clear worked examples with practice exercises and exam-style questions. Answers are at the back of the book. Contains content for all four modules of the syllabus in one book so students have a single resource to support them through the course. Detailed explanations and clear worked examples help students understand new mathematical concepts. Practice exercises for students to consolidate new skills. Exam-style questions encourage students to check their understanding and support them as they prepare for examinations. Answers provided at the back of the book so students can self-assess their progress and understanding.